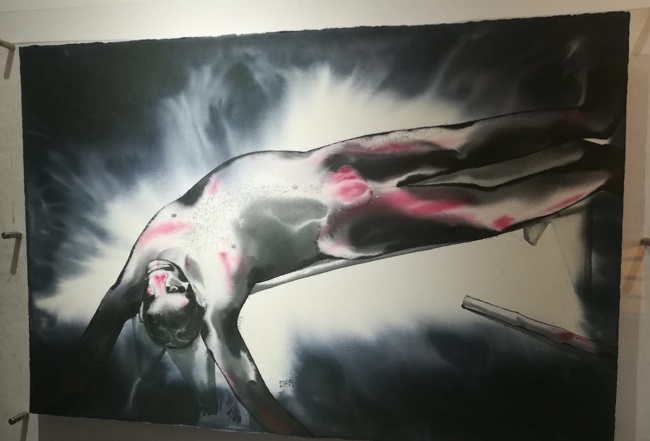 One of the reasons curator Johny ML chose the theme of body is to remember late artist Asanthan, whose body was treated in an unceremonious way a year ago. Share @Facebook Share @twitter Share @reddit The museum, unlike others in the city, is surprisingly open at 7 in the evening. People going to the beach across the road, see the lights and walk in curiously. From the looks on their faces and curious enquiries, it’s clear many haven’t been there before. 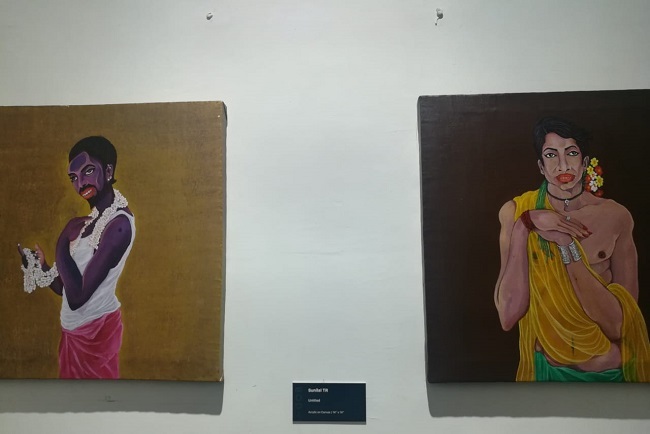 It’s relatively new, this art museum that opened months ago at what was once a palace in Shanghumugham, Thiruvananthapuram.An exhibition has been going on there since the end of January – ‘Body’, curated by Johny ML, well-known art critic. 58 artists – 16 Malayalis among them – are taking part in the exhibition. The old palace is carpeted, walls painted in cream and renovated into a beautiful two-storey building. Rooms after rooms of paintings and sculptures are on both the floors, beginning with the first telling exhibit of a naked woman sculpted sitting impassively on a sofa. Courtesy, artist Ravinder Reddy. From the little note outside introducing the exhibition, and from the words of the curator, it is clear that the organisers knew that this exhibit, one of the first the visitors will see, could appear to be too revealing for some. Woman on Charpoy by Ravinder Reddy“There could be a sort of revulsion at first, but if they watch it for thirty seconds, they might learn to appreciate it. What becomes obscene to your eyes is that part of the body that others don’t see,” Johny says. The little note outside too says, “Irritation is not hatred. It is a response when one confronts something in him/her but does not want to acknowledge its existence.” It advises you not to turn your face away but to keep looking for fourteen seconds when irritation would ‘automatically evaporate and rays of clarity would seep in’.Remembering AsanthanOne of the reasons Johny chose the theme of body is the unceremonious way in which an artist’s body had been treated a year ago in Kochi. 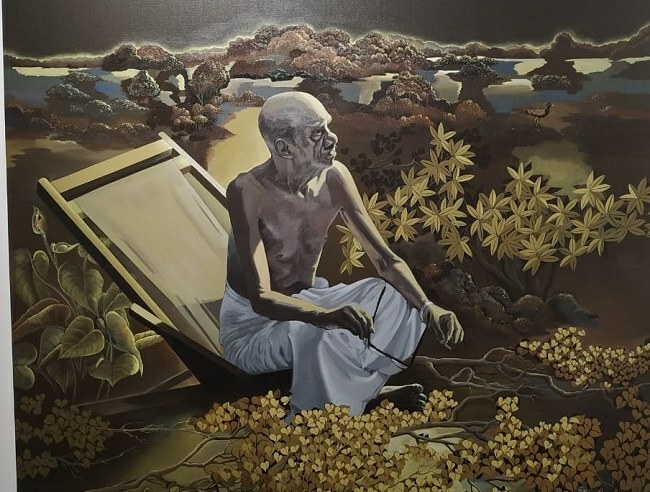 Asanthan, an artist who died on January 31, 2018, was not allowed to be taken to the Durbar Hall art gallery in Kochi, to be placed in the front for people to pay their last respects. The authorities of a temple nearby objected to a body being kept so close to a place of worship. When the police intervened, the temple authorities agreed that Asanthan could be placed at a far corner of the gallery, away from the temple. This was seen as an insult by many, especially so because Asanthan was a Dalit artist.“I was there when the Hindutva forces opposed placing his body at the gallery. A person who was a respected artist when he was alive gets reduced to a Dalit dead body when he dies. He is no more an artist, he is just a body,” Johny says. It is on the same day the next year that the exhibition opened – January 31.Johny approached 60 artists with the theme, artists belonging to different states. 58 of them agreed to join, two could not finish on time. “The concept would have different meanings to different people. It’d be different to man, woman and trans person. There would be political bodies and social bodies, the body of the killed and the body of the killer. There are so many more identities to a body than we think about,” he says. Works of Sunilal TRDifferent bodiesRajesh Soni has placed monochromatic photographs of a man in different postures – a leg up in one, standing on two stools in another, sitting drinking water in a third and so on. The 14-second rule is very reliable, you find out, when you keep looking at the photographs and learn to get something out of it – mere rousing of interest if nothing else. Chithra EG’s white sculpted upper bodies of two persons facing away from each other are what she calls Intimate Debators. Expressionless faces, one looking up, perhaps for answers, one straight ahead.Usha Ramachandran’s, a door away, has a naked woman lying down, hurt, and another in black burqa, covering her face, crying perhaps. Murali T, next to her paintings, has kept acrylic works of ritual arts – Mamankam and Chithra Vadham.Johny talks about the water colour pictures of a man lying upside down with many injuries in his body – work of Ajit Kumar, the director of the art museum. Everything They Didn't Tell You by Ajit Kumar“Injuries become evidences of what your body went through, but the wounds to your mind are intangible, invisible, with no record,” the curator says thoughtfully. He then mentions the many faces of Kali that Suvanwita Saha, an artist, has hung on forks.When nudes stop to shockNaked bodies appear across the paintings and sculptures and Johny says once the first shock of the inexperienced visitor who’s new to art fades, the iconic becomes the ordinary. “The transformation of the godly woman to the ordinary woman, that’s what happens,” he says.It’s not all women – though one gets the idea that most nudes are those of women in art exhibitions – and it is not all naked. But Johny ML is right. Kids stop giggling and grandmothers don’t turn their faces away once they reach the upper floor, by then used to the form and looking for more within. Some of them are obvious – Glower Paul’s It’s all in the head highlights the head and the many connections it forms, even as there are bodies all around. KT Mathai’s mixed media on paper puts out a colourful display of prayers and people, called Nobody’s Séance.Themes of love, god and lifeThere is love – Manjunaath Naik’s In the name of love, lust and social media – depicts a man’s well-built body and a pig’s head and a woman’s flabby body with a lion’s head. 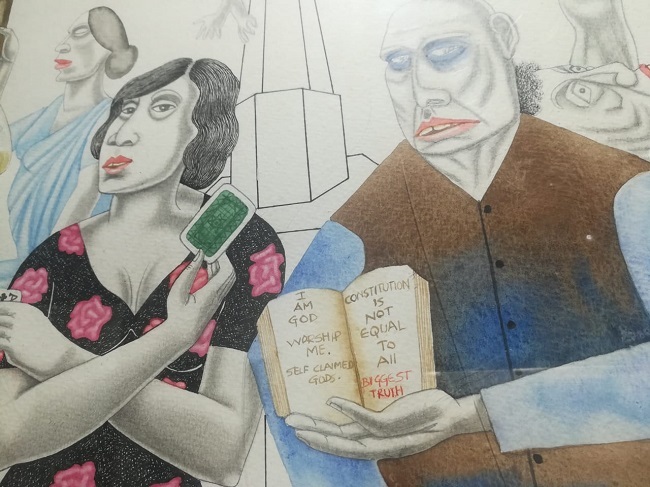 There is hypocrisy – depicted by Vitesh Naik in mix media as many people’s stories with a readable text that one man holds up – “I am God, Worship Me – Self claimed Gods. Constitution is not equal to all – Biggest Truth.” There is the body of a trans person, unexplained, warm and welcome – work of Sunilal TR. Part of The world of hypocrisy - 2 by Vitesh NaikThere is god too, if you look. A Jesus-like man with drops of blood on his body, watching over famished old men, lying among skeletons and vultures waiting for what becomes of them. 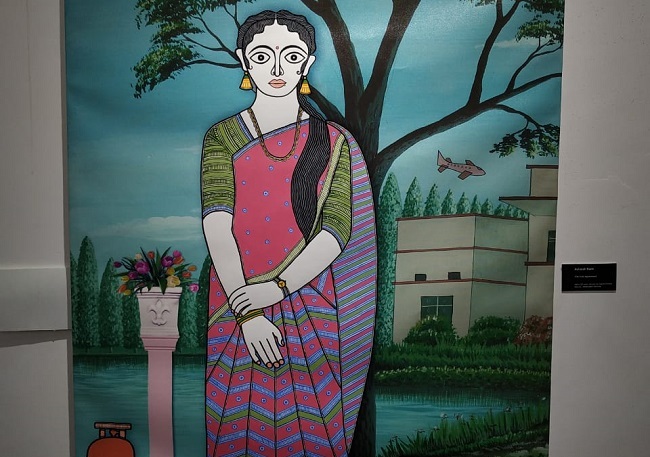 Artist Sukesan Kanka calls it Never the less he persisted.And real life – a woman dressed up, very obviously for the traditional ‘seeing of the girl’ before fixing an arranged marriage. Like the typical photos you see in matrimonial pages, here is a young woman, wearing her nice sari and ornaments, showing off her long hair, only her face giving away her helplessness in being reduced to a mere object. Avinash Karn, the artist, calls it The First Agreement. Part of The First Agreement by Avinash KarnThe Large PictureLarge art exhibits appear in the central room upstairs – Tom Vattakuzhy’s Song of the Dusk – III and Sajitha Shankhar’s After Body Series among them. Tom’s oil painting of a little girl hugging her flute-playing dad is especially endearing when you watch it, absorbing the twilight scene of a village home. A woman, you assume as the little girl’s mom, is in the background, standing next to a broom she’s just used, and leaning against the wall with her thoughts. 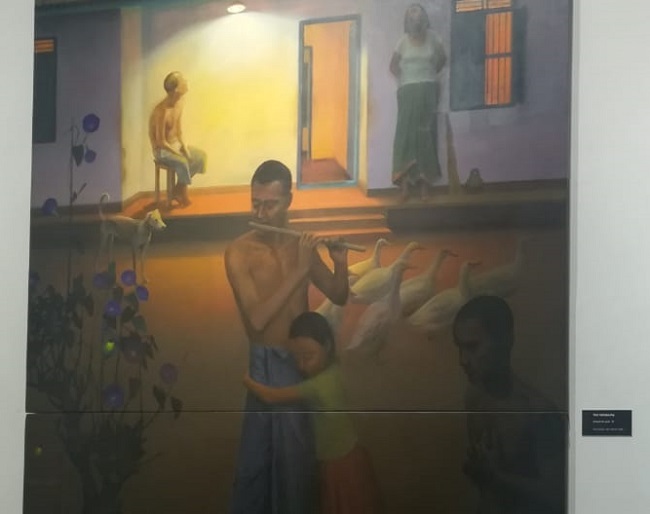 An older man, presumably the granddad, stares at the low watt bulb, a dog stops to listen to the music, ducks walk by and another man in the dark keeps his hands to his chest. Part of Song of the Dusk - III by Tom VattakuzhyJohny says you should draw your own conclusions and that is all right, you don’t need to wait for an art critic’s opinion or even the artist’s take to enjoy a work of art. Old theory that still holds true, you know, as you stop reading the details and simply watch writer Basheer’s familiar skinny form sitting among nature – Shaji Appukuttan’s work. Speaking inner body by Shaji AppukuttanThe exhibition ends on March 31.